The present Church of Saint Rose had its beginning as Lummis Hall, the town hall where Mass was celebrated as early as the Civil War days. Beginning in 1876, Sodus Point was a mission station out of St. Michael’s in Lyons. Then, in February of 1885, Rose Lummis and her half-sister Georgette deeded Lummis Hall to the Catholic Diocese of Rochester. Bishop McQuaid of Rochester blessed it as St. Rose Church in 1886 and although it continued under St. Michael’s, St. Rose was now a mission by virtue of the fact that the congregation had its own building. In October of 1887, the Lummis sisters bought land adjacent to the building and deeded it to the church for possible future expansion or a rectory. (By 1906, some enlargement did, in fact, become necessary and was carried out during the next two years. However, the main part of the building retained it’s original lines of a town hall and the structure has changed little since then.) 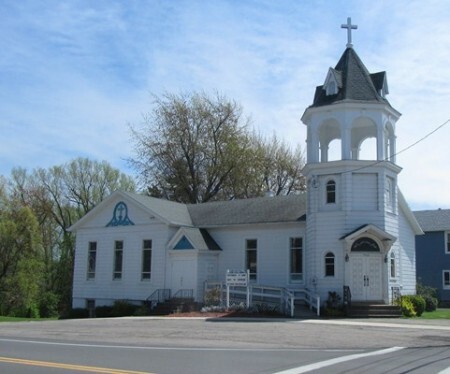 In December of 1887, St. Rose Church of Sodus Point was incorporated under that name. In 1922, St. Rose was designated a chapel (a term which, for purposes of clarity in this article, denotes that Mass was offered only during the summer months) of the Church of Epiphany in Sodus when that parish was established. 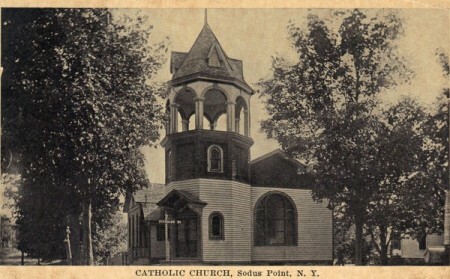 Then, during the Depression both the Sodus and Sodus Point churches were assigned to St. Mary’s of the Lake in Ontario, Sodus as a mission and Sodus Point as a chapel. St. Rose Church of Sodus Point celebrated its centennial in 1985. In the early 1990’s neither the Church of Epiphany nor St. Rose Church was filled to capacity for the Saturday evening Mass, so in 1992, the parishioners voted to make Epiphany the site of that Mass. The church is named for St. Rose of Lima, born Isabel de Flores y del Oliva in Lima, Peru, in 1586. She entered a convent when she was 20 and became a Dominican sister, dedicating her life to prayer and the Eucharist. She worked among the poor people of Peru and is credited with being the first person to begin any kind of outreach to South America’s poor. Isabel died at age 31 and later became the first person native to the Americas to be canonized by the Pope. The church’s name is appropriate. The Lummis family was prominent in Philadelphia and a major landowner in the Sodus district. Rose (and late Georgette) converted to Catholicism in the early 1860’s and became known for her many benefactions to the Church in both the U.S. and Canada. Rose Lummis spent her life working with and for the church especially with the poor and needy. Her life is depicted in two books entitled “Madame Rose Lummis” and “The Annotated Rose” and would later have a tour boat named after her. St. Rose of Lima Church – St. Maximillian Kolbe Parish as it appears today. St. Rose is located at 7502 Fitzhugh Street in Sodus Point, NY.